The Most Expensive Typo In History Was Created By A? When it comes to typos, there’s no shortage of costly examples in history. Sometimes it takes the form of errors in advertising. A car dealership in New Mexico once sent out scratch-off tickets to 50,000 potential customers where one of them should have won a thousand dollars. Instead, every ticket was, erroneously, a thousand dollar winner (for a grand total of 50 million dollars)—the dealership cleaned up the mess by issuing a total of 250,000 dollars worth of prize money to all the ticket holders. Other times, there are bookkeeping errors. An extra letter entered into New York City’s accounting software cost the city 1.4 million dollars one year when it doubled the Department of Education’s transportation budget. If you really want to hit the grand slam though, that’s all chump change compared to the power wielded by NASA programmers. When it comes to the space race and the continued exploration of the final frontier, the stakes are high, the rockets are huge, and the explosions that result from errors are as costly as they are enormous. When it comes to the most costly of these typo errors (in a strictly dollar-for-dollar sense and, respectfully, leaving the cost of human lives lost in the pursuit of space travel out of the equation), there’s no error that can hold a candle to the single typo that brought down the Mariner 1 launch, a missing “hyphen” in the onboard guidance system software. Mere moments after launching a hulking Atlas LV-3 Agena-B rocket packed with fuel, it began responding erratically to guidance system commands from Ground Control. 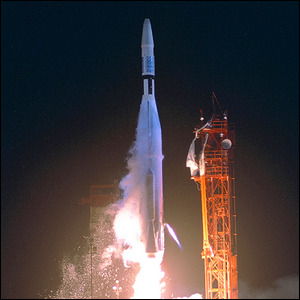 Shortly thereafter, the rocket experienced a software-based guidance system failure. At that point, only a few minutes after launch, the rocket was flying out of control at the mercy of physics and fate. With the rocket off course and out of control, the standing Range Safety Officer made the very expensive but necessary call to issue a self destruct command to the rocket over the Atlantic Ocean. Thankfully, it was a probe launch and not a manned launch; the losses were merely time, money, and equipment. How expensive was the catastrophic failure of the Mariner 1 launch? In 1962 dollars, the cost of the lost mission was 18.5 million dollars. Adjusted for inflation to today’s dollar, that put the cost of the failure at roughly 149 million dollars. While not the most expensive failure in the history of scientific and engineering endeavors by any measure, it’s certainly the most expensive one caused by a single typo.